Think I will check out your new blog! I am so exited as there are two pandas now enroute to spend 5 years in Toronto and then 5 years in Calgary... so I may actually get to see them at some point. 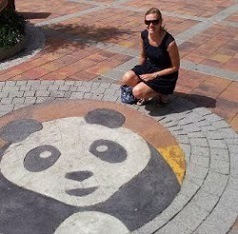 Today my husband and I did a jigsaw puzzle of 2 pandas laying on their backs munching bamboo. I hope you get to see the Canadian pandas at done point! It is very exciting.